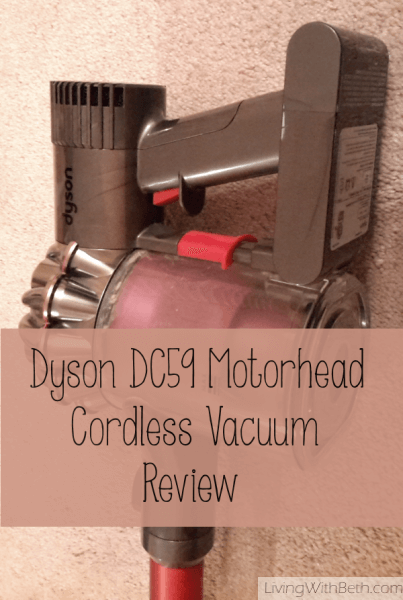 Like many first time users of a Dymo vacuum, I was enthralled when I received a demo Dyson DC59 Motorhead Cordless Vacuum in return for an honest evaluation. The cordless Dyson DC59 Motorhead lets you vacuum anywhere, anytime, going nearly a half hour without charging. It also comes with several attachments, going from cable-free stick vac to cordless hand vacuum in a jiffy. The DC59 Motorhead produces such a powerful suction and cleaning action that your carpet will look almost like it’s been freshly shampooed. You’ve never seen anything like the DC59 Motorhead. Here are several ways that this remarkable device can simplify your life. No more moving the power cable around to different outlets so you can vacuum an entire floor. Vacuum in every corner and along every wall, even where you can’t reach with a regular corded vacuum. Forget having to feed quarters into gas station vacuum or drag a corded vacuum into your driveway or garage. Convert the DC59 Motorhead into a cordless hand vacuum, and your vehicle gets clean in 5 or 10 minutes. It does an amazing job picking up food remnants, dirt, dried leaves, small stones and whatever else lurks in your vehicle’s seats and rugs. No more excuses for not vacuuming your stairs. With its amazing lightness and no power cable to drag around, the Dyson DC59 Motorhead makes vacuuming your carpeted steps a breeze. Your stairs may collect significant built-up dirt, especially if your family enters and exits the house using the stairs or if you have pets who like to lounge on them. Quickly clean your floor and carpet when you expect guests on short notice. If you have kids or pets, you probably feel like you need to vacuum far more often than you actually do it. The DC59 Motorhead lets you whip it out so effortlessly that you’ll never again feel guilty about the food crumbs or pet hair on the floor. Easily clean up small messes on your floor, carpet and furniture. Kids eat popcorn in front of the television and leave kernels all over the carpet? Pets leave fur in their favorite napping or playing spaces? No problem! Same goes for sand, leaves or dirt tracked into the house from outdoor excursions. Kids can pitch in with cleaning. The DC59 Motorhead is so light (around 5 ounces) and simple to maneuver that youngsters won’t have problems pushing it around. It also won’t choke as easily on large debris that may clog a lesser vacuum, and it’s less likely to accidentally grab things it shouldn’t, like cables. It’s also a bit less noisy than my regular vacuum, making it less scary for kids and animals.